View Complete Multimedia Classroom List. Classrooms are requested through the Registrar's Office and are funded by the LSU Student Technology Fee. Student Technology Assistants check the classrooms on an average of 3 times per week to check out the proper operation of the installed equipment. Issues are fixed or reported to Multimedia Classroom Support for immediate repairs or replacements before the start of the next scheduled classes. In addition to weekly maintenance, all classrooms are checked during semester breaks for necessary replacements and improvements. If your department is planning on creating Multimedia Classrooms that utilize technology, ITS NEEDS TO KNOW!! We must be involved in the Planning Stages. 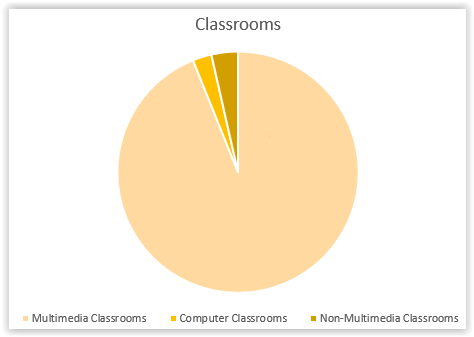 PLEASE READ THIS: Multimedia Classroom Budgeting & Procurement. The Multimedia Classroom Support team supports the University’s needs for presentation media equipment by maintaining, scheduling, and circulating equipment to all segments of the campus. Traditional Audio / Video equipment, as well as portable multimedia equipment, is available for delivery to classrooms as well as on-campus offices. Instructional assistance in the proper use of the equipment is available upon request. View the Software List GROK article: Software in Computer Labs, Classrooms & VLab. Lists the Availability and Location of software that is available On-Campus at LSU. The Software List is sortable by Computer Labs, Classrooms, and the LSU Virtual Lab. Request New Software at softwarerequest.lsu.edu. Specify the Audience to be: Multimedia Classrooms. Your Software Request will be reviewed for reliability and feasibility. It will be considered for its potential use for the betterment of Louisiana State University. Your Work Order's Status can be tracked at http://itservice.lsu.edu. Desktop computer(with DVD drive) and a Document Camera. Provisions for auxiliary audio and video hook-ups (laptops). An input source switcher/controller on the podium makes toggling between the sources and control over the projection possible. LCD projector(s), Audio amplifier and speaker(s), and a wall-mounted projection screen. IP devices which allow remote control and monitoring of projection systems. Use of equipment is free of charge if it is to be used in credit courses offered On-Campus. Use of equipment not associated with scheduled courses is subject to a rental charge. EQUIPMENT IS ONLY RENTED if there is No Class Related Need for the equipment. Requests for equipment should be made by calling 225.578.7622. Do this AT LEAST 1 Day in advance! Late requests will be honored if inventory and our delivery schedule permit. The Borrower must be affiliated with LSU. The Borrower is responsible for the care of the equipment while in possession. The equipment and components must be returned as packaged. An extension on the use of the equipment may be granted based on availability. Any damaged or stolen equipment should be immediately reported to our office. A telephone in most classrooms connects directly to Multimedia Classroom Support for reporting computer or multimedia equipment problems. ITS will field computer related calls and route all equipment calls to CTSS where on-the-phone and remote control assistance will be provided. A Student Technology Assistant is promptly sent to the classroom if remote assistance did not resolve the problem. Schedule a Visit from a Student Technology Assistant. Faculty and TA’s can call 578-7622 for an on-site orientation on the Multimedia Classroom Computers. This includes instruction in the proper use of multimedia equipment in these classrooms. View the attached presentation to learn more: Multimedia Classroom Podium: Tutorial & User Guide.